Heat and timing are key elements to master when learning to cook. 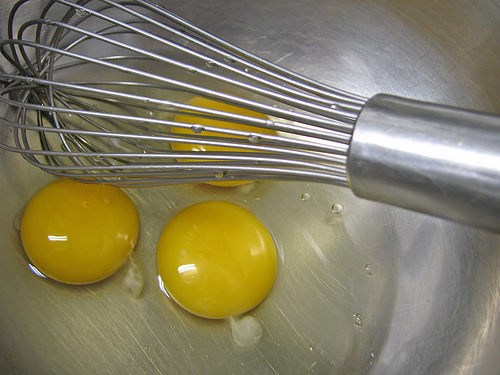 One trick I use when making an omelet; is heat the pan, whisk the eggs, add them to the pan, then wash the dirty bowl and whisk while the eggs begin to cook. The other night I made a three egg omelet, using my dish washing routine as the timer. Standing at the sink I noticed that the eggs were'nt cooking as fast as usual. I quickly realized that the pan was on the wrong burner. You see, my stove has big burners in front which quickly heat the outside of a pan. The back burners on the other hand are the opposite, heating the center of the pan. That’s great to maintain a simmer, but not hot enough for a sauté. So, as soon as I noticed the omelet was not sizzling from lack of heat, I brought it forward to speed things up. I finished washing the bowl and whisk, and then went back to the stove to finish the omelet. Using a silicone spatula I moved the eggs around the pan, gently folding each side of the omelet over to envelope it’s filling. I slid the omelet onto my plate, sat down and ate. It seems that this winter my good friends keep me on speed dial when needing a gravy lifeline or a bit of advice on cooking. Helping my friends in this way really sparked my thoughts on the value of kitchen experience. I’ve been thinking about recipe use comparing the knowledge of an accomplished cook to that of a novice. Experience based taste matters when it comes to reading through and selecting a recipe. During the holidays my mom and I decided to skip the tarragon in a dish, mid-preparation, because we agreed, tarragon is pungent and throws its weight around. Other decisions I’ve made allow me to condense a recipe's step-by-step narrative. For instance; not using every mixing bowl, whisk, platter, and skillet, a recipe calls for, makes for easy clean up without affecting the flavor of a dish. Another area where kitchen knowledge is valuable is when reading a recipe. Sometimes it's a matter of saying "that sounds great" (or awful), but a lot of times it's the ability that experience has allowed me to figure out a confusing recipe. Recently I read directions that said "continue to let the vegetables simmer…" Well, that made no sense because there were no liquids in the dish, making the word simmer non-applicable. After skimming the recipe's ingredient list again, I decided that the author had switched the word "sauté” for "simmer", an error sure to confuse the cook. What happens to the inexperienced cook who prepares that recipe? Someone who knows the difference between sauté, simmer, broil or bake could easily decipher that recipe. Inexperienced cooks however, may give up, call a friend, or take a chance and add wine or broth, ending up with a glippity-glop. The difference between an expert cook and the beginner became apparent when I blended four of Julia Child 's recipes together to create a delicious creamed spinach dish. More accurately, Spinach in Mornay sauce with Gruyere topped with a bread crumb gratinee. This was simple for me, already knowing what a Béchamel looks like. I did however; have to pay close attention to the many detailed steps chosen from the various recipes I fused together. That dish brings me to Julie Powell's book, Julie and Julia: My Year of Cooking Dangerously. This book, which started out as a blog, is where Julie endeavors to cook all the recipes in Julia Child's book, "Mastering the Art of French Cooking". The author took the project on to challenge herself hoping to give her life some meaning. This was, to say the least, an ambitious journey as a novice cook who had no idea what she was getting herself into. At first she is challenged by the basics. How do you make the foundation sauces? What does she mean by mince? Oh yeah, there's an illustration of that. Later in Julie’s culinary escapades it's a search for odd, unfamiliar ingredients Child’s recipes call for. Included in the focus of one chapter is a marrow bone, the oddness of this little morsel, the trouble with finding it, and the question of what to do with it in the recipe. Julie regularly finds herself putting a meal on the table at 11 at night, exhausted and not really interested in eating the crêpes she just spent five hours preparing. Her husband tries to remain positive about her project despite the messy kitchen, late dinners, and some less than successful results. In addition Julie packs on the pounds as Chef Child’s recipes call for lots and lots of butter. Powell is frequently confounded by Child’s Cookbook but manages to forge through her personal challenge. Julie does improve her cooking skill; several recipes turn out brilliantly and at a decent hour to boot. She masters pate brise without having to think, and aspics quickly become routine preparation. This book is about several things, accomplishment, Julia Child, relationships, and how messy a kitchen can get. It's also about learning to cook and how experience, through trial and error, can become a powerful teacher. By the end of one year Julie Powell learns to flip food in a pan (something I still can't do), figure out realistic prep times, and that Child was heavy handed with the butter. I knew my omelet wasn't cooking fast enough the other night because as I started to wash my dishes because I didn’t hear it sizzling. Over time and with experience I’ve learned to use all my senses when cooking. Precisely the experience that caused me to say "that's insane" when I heard about Julie Powell's writing project. "Do you know what you’re getting yourself into?" I thought. I realized that she didn't and that’s precisely what makes this book so entertaining. The insight Powell gains through her experiences make Julie & Julia, a fun and worthwhile read for any cook, novice or pro. Mark Johnson is an experienced cook and writer who generously contributed to iSimmer's blog. Thank you Mark! This entry was posted in Uncategorized and tagged book review, book review of julia & julia, books on cooking, cooking, experienced cooking, isimmer blog, isimmer.com, learning to cook, mark johnson, reading. Bookmark the permalink. I enjoyed Mark's post. Would love to have a combo-post from both him and his mom about cooking together during the holidays!